"The day of Jehovah is coming! It is near!" In the earthly resurrection, the resurrected ones and their families, will have a "lot" or an "allotted place" in the future paradise on Earth. In Ezekiel's prophecy chapter 47:13-48: 35, Jehovah God outlines the method of allocating territorial "lots": "This is what the Sovereign Lord Jehovah says: “This is the territory that you will assign as the land inheritance of the 12 tribes of Israel, and Joseph will have two portions"" (Ezekiel 47:13). The territorial inheritance corresponds to the alloted places given to the twelve tribes of Israel, corresponding to the whole of the world resurrected population risen, with the Great Crowd, according to Jesus Christ: "Jesus said to them: “Truly I say to you, in the re-creation, when the Son of man sits down on his glorious throne, you who have followed me will sit on 12 thrones, judging the 12 tribes of Israel"" (Matthew 19:28). 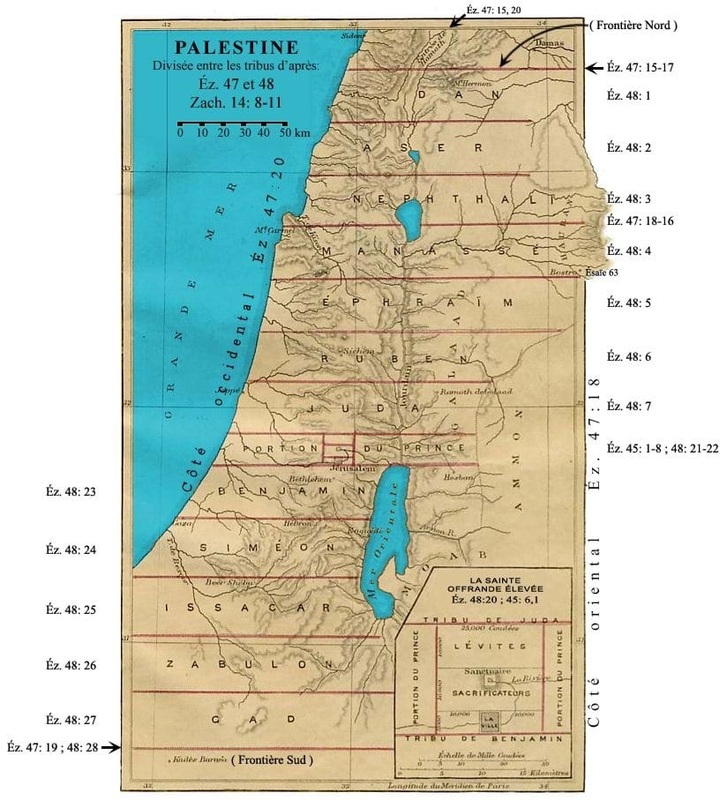 The summary of the method of allocating territories on the surface of the earth is portrayed in the form of general recommendations which takes as a model or as a "prototype" of the nation of Israel. For this the word "nation" will be used. To better visualize and understand the biblical explanations of Ezekiel 47:13-48: 35, please refer to the photo below. "So there were 12 sons of Jacob. The sons by Leʹah were Jacob’s firstborn Reuʹben, then Simʹe·on, Leʹvi, Judah, Isʹsa·char, and Zebʹu·lun. The sons by Rachel were Joseph and Benjamin. And the sons by Bilʹhah, Rachel’s servant, were Dan and Naphʹta·li. And the sons by Zilʹpah, Leʹah’s servant, were Gad and Ashʹer. These are Jacob’s sons, who were born to him in Padʹdan-aʹram" (Genesis 35: 22b-26). Initially Jacob wanted to marry only with Rachel, nevertheless by a ploy of his father (of Rachel), Laban made sure that he married to Leah (the firstborn daughter). And then, he gave to Jacob, Rachel (the second daughter). So Jacob, despite himself, found himself with two wives, Leah and Rachel (Genesis 29: 21-19). Rachel had a servant, Bilhah, whom she gave as an additional wife to her husband, so that she might give birth for her, to give to Jacob, children because she was provisionally barren (at the beginning of the marriage) (Genesis 30: 1-8). Leah, Rachel's sister, did the same with her servant, Zilpah, she gave her to Jacob, to give him more children, in her name (Genesis 30: 9-13). Her children: Ruben (firstborn, stripped of his birthright), Simeon, Levi (did not inherit a "lot", but he did his ministry in the temple), Judah, Issachar, Zabulon. Her children: Joseph (inheritance of the birthright, lost by his older brother, Ruben, and thereby obtains a double territorial share for his two sons (Ephraim (firstborn) and Manasseh. Together they represented the tribe of "Joseph" (Ezekiel 47:13)). Benjamin second son of Rachel). Jacob's third wife: Bilha (Rachel's servant who would have children in the name Rachel). Her children: Dan and Nephtali. Jacob's fourth wife: Zilpa (Leah's servant who would have children in the name of Leah). Her children: Gad and Asher. To understand the logic of the territorial distribution of the map above, mentioned in Ezekiel's prophecy, which will serve as a model for the worldwide distribution of territories to the future resurrected ones, it is convenient to exam the written history of Israel, in the Bible. For this it will begin with the territorial strip of the prince (or chieftain), who is in the center of the map of Israel, with the temple in the middle. To the north of this strip, is the tribe of Judah (son of Leah) and in the south of Benjamin (son of Rachel). Why are these two tribes next to the prince's strip of land? There are two complementary biblical explanations. First, there are two tribes who represented the kingship of Israel. Second, during the division of the kingdom of Israel, these two tribes were allied and constituted the kingdom of Judah. On the basis of these two information, this juxtaposition seems to indicate the kinship relationship of these two tribes with that of the prince who will be an earthly representative of the heavenly kingship of the 144,000 (Revelation 5:10 and Psalms 45:16). The resurrected ones who have a proven relationship with the prince (chieftain), will inherit the lots that will be next to the prince's strip. Nevertheless, regarding the prince's sons, it is written in the prophecy that the chieftain (the prince) will have to give them a lot in the alloted place of his own territory: "The chieftain should not take any of the inheritance of the people by forcing them off their property. He should give his sons an inheritance from his own property, so that no one among my people may be driven from his property" (Ezekiel 46:18). It is the prince (or chieftain) who will administer the distribution of the lots of the "land", for the resurrected ones who will be under his administration. For this, we must rely on the family or genealogical relationship of the resurrected ones. The genealogical process will be (according Ezekiel’s prophecy): The closer to the family of the family of the prince (chieftain), will be to the closer territorial (to the prince's strip). 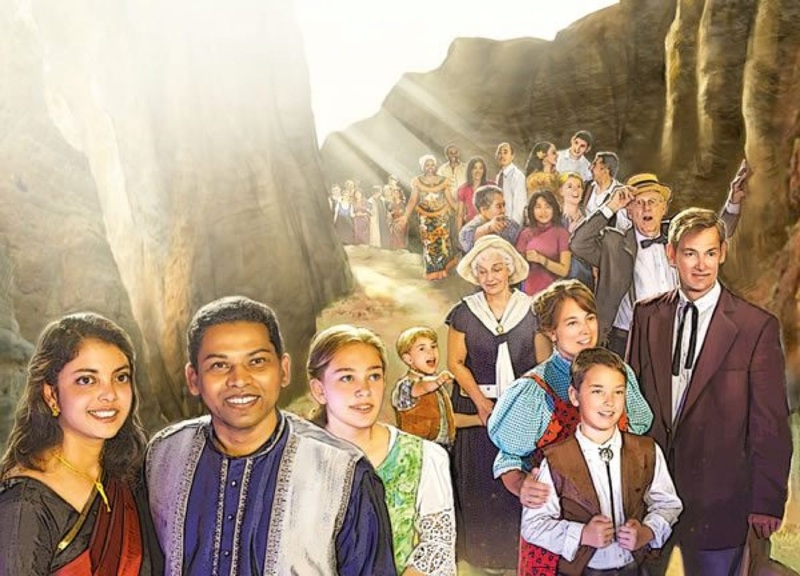 On the contrary, the distant genealogical relationship will be, maybe nonexistent, the remote away the territorial strip will be (see Ezekiel 47:22: the "foreigners" could refer to the resurrected ones who will have a distant genealogical relationship with the whole family of the "country" of "Israel" (as prototype). To verify the accuracy of this interpretation, we must compare the picture above, with the children of Jacob's four wives. Thus, one could consider that the names of the tribes whose children born directly from Rachel (later) and Leah are related in the "first degree", while the names of the tribes of the sons of the two servants who gave birth in the name of their mistress, were related to the "second degree". Regarding the children of these two women (Bilha and Zilpah) (Dan and Nephtali for Bilha and Gad and Asher for Zilpah), the corresponding lots are in the remotest territorial strips, both north and south of the prince's lot. The observation is that the two brothers of the same mother (Zilpa), Gad and Asher, have separate lots, one in the far north (Asher) and the other in the far south (Gad). In addition, the lots of Dan and Nephtali, two brothers of the same mother (Bilha), have a strip still separated by the Asher band. This seems to confirm that these lots will be given to the resurrected "foreigners" (in the far north or in the far south), according to Ezekiel 47:22, as genealogical remotest relationship with de chieftain or the whole "Israel" (as propotype), in the "nation" they will be resurrected. 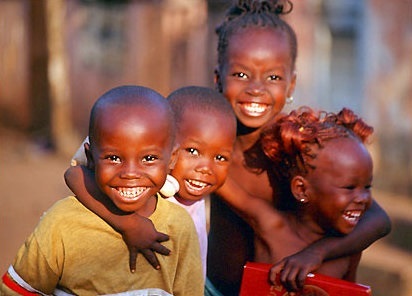 Nevertheless, the fact that they are gathered together in the same tribe (in the same strip), means that these resuscitated people will be gathered with their family, even if they will be very small. For his kinship (other than his sons), he will first assign lots in the "Judah" strip, north because Judah was born before Benjamin (see the map). Still regarding his kinship, when the lots (in the whole strip) have been completely distributed in the north, he will award lots, this time in the southern part, the "Benjamin's strip" (who was born after Judah). This logical process (first north-last south) of attribution is repeated twice: With regard to the strips of land, "Reuben" (firstborn of Leah), "Ephraim and Manasseh" (Son of Joseph, firstborn of Rachel), their respective lot , is in the north (like Judah, who was born before Benjamin). This seems to indicate that the "firstborn" of the resurrection, having a proven family relationship with the prince's nation, will inherit first from the northern part of the prince's strip, starting from the "Judah" strip (at North). As for the "foreigners", the logic of distribution seems different: The first resuscitated whose kinship with the nation "Israel" will be very distant, or not proven, the prince will assign them lots from both ends border of the country : from the far-north end of the nation, to the far-south end of the nation. Why ? Dan was the firstborn of Bilha, whose strip is at the northern limit of the nation (in the map). While Gad was Zilpa's firstborn, whose strip is at the southern edge of the nation. This distribution of the allotted places between the resurrected ones with a known kinship and the resurrected ones whose kinship is not determined (foreigners), is logical. Why ? The prince (or chieftain) is not supposed to know the number of the resurrected ones of his own nation, especially, between these two categories, with known ancestry and distant ancestry (maybe unknown). Therefore, it will be in his best interest to maximize the buffer zone between these two categories, in order to better organize the distributions among these two great categories, as the resurrected people are coming in his "lot" as "nation" or "country" (Ezekiel 47:21). Looking at the map, we understand that the prince will give lots first in the northern part (regarding from his own strip), in the direction of north for the people with kinship known. And for the "foreigners", people with unknown kinship (or far kinship), (also in the northern part) from the far-north to the south. Then, when all the lots, in the northern part will be allotted (to the two groups of the first resurrected), the prince will begin to give the lots in southern part in the same process (regarding from his strip): from "Benjamin's strip", direction towards the south. Why ? In examining the map, Simeon was born before Issachar, who himself was born before Zabulon (for the group of kinship known), and the last group of unknown kinship, in the far-southern part of the country. They will be fixed by God who will determine the size of the country, and the size of the tribes (Ezekiel 47 and 48). Nevertheless, it is the prince who will concretely apply the border modalities: "The chieftain should not take any of the inheritance of the people by forcing them off their property. He should give his sons an inheritance from his own property, so that no one among my people may be driven from his property" (Ezekiel 46:18). If, in this biblical text, it is not directly written that it is the prince (chieftain) who will administer the distribution of lots (or alloted places) to the resurrected people, the fact that he could unjustly dispossess someone of his property, demonstrates that he will have this authority given by God. However, it is directly written in Ezekiel 45: 8: "This land will become his possession in Israel. My chieftains will no longer mistreat my people, and they will give the land to the house of Israel according to their tribes" (Ezekiel 45: 8). According to the narrative of Ezekiel 47:13-48:35, also referring to the picture above to better understand, the general border requirements will be simple. The north-south boundaries separating the tribes will be linear and equitably divided : "You will inherit it and receive equal shares. I swore to give this land to your forefathers, and now it is assigned to you as an inheritance" (Ezekiel 47:14). The east-west borders will be natural, seas or oceans, rivers or inland seas. The lakes can be an integral part of a tribal lot. And of course the borderline with other nations (east-west or north-south). "Of all nations and tribes and peoples and tongues"
"After this I saw, and look! a great crowd, which no man was able to number, out of all nations and tribes and peoples and tongues, standing before the throne and before the Lamb"
These three expressions, in addition to the different tongues, make it clear that Jehovah God, by means of his Kingdom, will unify the different peoples while taking into account their cultural, racial or tribal diversities (we can expect that, futures, there will be a linguistic unity which purpose will be the worldwide unity (particularly in the worship to Jehovah God): "For then I will change the language of the peoples to a pure language, So that all of them may call on the name of Jehovah, To serve him shoulder to shoulder" (Zephaniah 3: 9)). There will be nations without nationalism or patriotism, tribes without tribalism or racial diversities without racist differences. There will be lovely unity in lovely diversities. When in the prophecy of Ezekiel Jehovah God (as well as his Son Jesus Christ) hints that the whole of humanity will represent the 12 tribes of Israel, that does not mean that all nations will have to bow to customs of the Jews. This expression is prophetic, in the sense that for about fifteen centuries, the nation of Israel has been the theocratic representation of what Jehovah God will do on all the earth by means of His Kingdom: "For since the Law has a shadow of the good things to come, but not the very substance of the things" (Hebrews 10: 1). 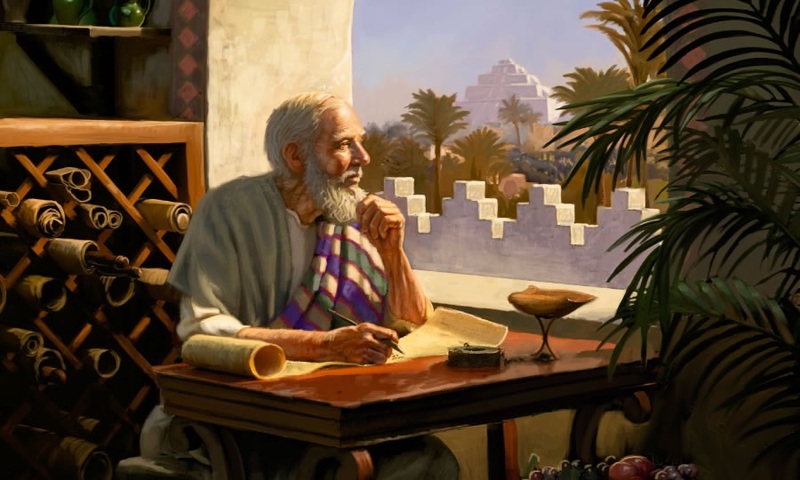 Even before the founding of the nation of Israel, Jehovah God made the covenant with Abraham (the prime Hebrew ancestor), that by his seed would be blessed all nations: "And by means of your offspring all nations of the earth will obtain a blessing for themselves because you have listened to my voice" (Genesis 22:18). And as the Apostle Paul wrote under inspiration, at the time of this Abrahamic covenant, he was not under the covenant of circumcision in the flesh, which characterized the nation of Israel later: "And he received a sign—namely, circumcision—as a seal of the righteousness by the faith he had while in his uncircumcised state, so that he might be the father of all those having faith while uncircumcised, in order for righteousness to be counted to them; 12 and so that he might be a father to circumcised offspring, not only to those who adhere to circumcision but also to those who walk orderly in the footsteps of the faith that our father Abraham had while in the uncircumcised state" (Romans 4: 11,12). And as the apostle Paul pointed out, under inspiration, what was in the flesh, the covenant of circumcision that characterized Jewish identity or belonging to the nation of Israel, would have a spiritual fulfillment: The covenant of the spiritual circumcision of the heart of the Israel of God by faith in Jesus Christ: "Circumcision is, in fact, of benefit only if you practice law; but if you are a transgressor of law, your circumcision has become uncircumcision. If, therefore, an uncircumcised person keeps the righteous requirements of the Law, his uncircumcision will be counted as circumcision, will it not? And the physically uncircumcised person will, by carrying out the Law, judge you who are a transgressor of law despite having its written code and circumcision. For he is not a Jew who is one on the outside, nor is circumcision something on the outside, on the flesh. But he is a Jew who is one on the inside, and his circumcision is that of the heart by spirit and not by a written code. That person’s praise comes from God, not from people" (Romans 2: 25-29). And the Kingdom of God, will take into account this cultural and racial diversity of all "nations, tribes, peoples and tongues", united (in their diversities) in the only worship to Jehovah God by means of Jesus Christ, His Son "You are worthy, Jehovah our God, to receive the glory and the honor and the power, because you created all things, and because of your will they came into existence and were created" (Revelation 4: 11, Zephaniah 3: 9 "the pure language" which will unify the peoples in the same worship to Jehovah God (The End of Patriotism)).